After years of battling for another Crankworx win, Tyler McCaul walked away with a tidy first place finish in the CLIF Bar Dual Speed & Style over friend and rival Kyle Strait. 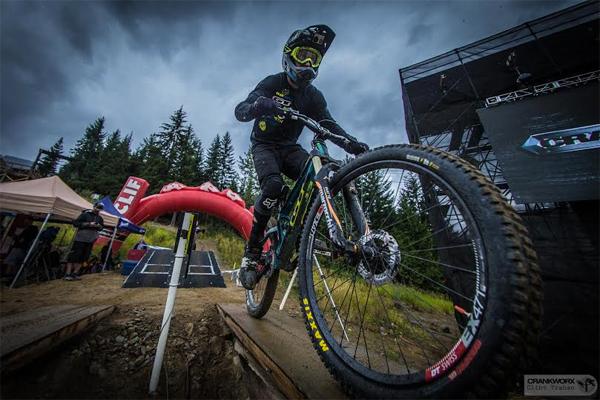 While not enough to push him into contention for the first overall title of the Crankworx World Tour, consistent solid performance in a typically wet West Coast rain shower seemed proved the perfect strategy over his fellow American competitor, who slid out on the final run. “We were a little worried about the ramps being slippery, but luckily it had traction on it,” said McCaul, who admitted he almost ditched his spin tricks as he stood in the start gate, worried the ramp would be slippery. After a quick test, he quickly set his sights on sticking to the game plan and the wet dirt proved his greatest asset, providing the traction necessary to really work the flat corners of this tight course. “I did my hard tricks in practice and usually I kind of save them for when it counts and I screw up,” he said. After falling on the last run, Strait said he was naturally disappointed, but still stoked to be part of the all California podium. “It was by far the best course of the year and by far the best Speed and Style. I’m super happy with how they’ve changed and adapted the course through the years and made it to be the best,” said Strait, noting he cannot help but love the sport having helped invent it. Dual Speed & Style was created in 2013 and many of the racers on course for this event were among its pioneers, including Cam Zink, Strait, McCaul and Howard. The overall Dual Speed & Style title, meanwhile, will go to Bernard Kerr, in absentia. His outstanding performance in Rotorua and Les 2 Alpes meant he could only be beat with a first place finish from Strait. Kerr chose to close out his stellar World Cup year, missing the first week of Crankworx and the final series event. He also remains on top in the King of Crankworx World Tour standings.